The 2017 Mercedes-Benz GLA 250 4MATIC. After driving to the Quail from the host hotel, the Monterey Tides at Sand City, in the 2017 Jaguar XE 35t AWD, it was straight into the 2017 Mercedes-Benz GLA 250 4MATIC. 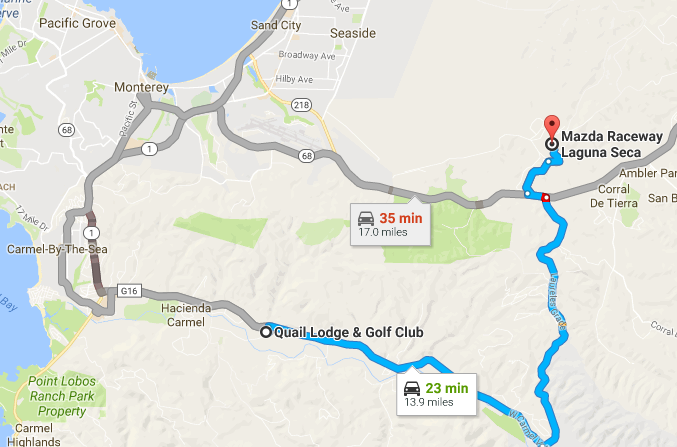 Quail Lodge to Mazda Raceway Laguna Seca (courtesy: Google Maps). 2017 Mercedes-Benz GLA 250 4MATIC. While Mercedes builds some of the best cars in the world, I've always been underwhelmed by their least-expensive cars. It costs money to build a car to a standard, and that's why E-Classes and S-Classes cost what they do. The first ML SUV was built to a price, and it showed. The most egregious example was the GLA 250's most direct ancestor, the 2001-2005 C230 Coupe. Car and Driver was as kind as it could be at the time, but if you read between the lines, you can see that Frank Markus had to really, really try. One, as with the C230, the GLA is one of Mercedes' lowest-priced offerings. At a base price of $32,850, only the CLA Coupe costs less, and then only by $150. And two: Cross the pond to Europe and you'll find this vehicle...marketed as a hatchback. To sell it in 'Murica, where the word "minivan" is (slightly) more socially acceptable than the word "hatchback", Mercedes elevated the ride height, and positioned it as a luxury small crossover. The good news is that its hatchback roots provide the "U" ("utility") in "SUV", with abundant and flexible cargo space, and make it a much more engaging car to drive on a twisty road. Bottom line: The GLA 250 4MATIC tracks like it's on rails. And the 2-liter turbo inline four's 208 horsepower works so well with the seven-speed dual-clutch automatic that it always seems to be in a sweet spot...delivering just the right amount of power with more the moment you want it, and (from what we could tell in 30 minutes) with zero turbo lag. Don't confuse that with being super-fast, though. Mercedes' own 0-60 estimate for the GLA 250 is 7.1 seconds. You'll keep up with Camrys and Accords at the stoplights and on-ramps. Big-time power is available by stepping up to the AMG GLA 45, which jacks things up to 345 horsepower, cuts 0-60 down to 4.3 seconds and comes with a base price of $49,900. Mercedes-Benz GLA 250 4MATIC interior. If you're coming straight from a more upscale ride, the GLA 250's interior appointments may seem a little spartan, but the materials are of a high quality, and fit and finish are excellent. So...knowing that a base Mercedes anything at the base price is a unicorn...what's it really cost? Well, window stickers weren't available, so using Mercedes' "build it" feature on their website, we find that going with the 4MATIC all-wheel-drive adds $2,000 to the $32,850 base price. The one we drove had 19-inch AMG twin 5-spoke wheels in black, which requires the "Night" package, which includes the $2,300 "Sport" package and gloss black exterior accents for a total of $2,600. To be honest, in half an hour, without a window sticker, I'm guessing as to what the car may and may not have had beyond that. So to be fair to Mercedes, let's be conservative and say that's it. Which gets us to a bottom line of....$45,055 including $925 transportation charge. And that's a big enough jump from the $32,850 base as to put it out of reach of anyone attracted by the base price. But even without the options, the 2017 Mercedes-Benz GLA 250 4MATIC surprised me. It's very good---quite possibly the best entry-level Benz yet.